Yesterday the SF Marathon announced the Ambassador team for 2012-13, and I was chosen to represent the race! I'm super excited to be part of the team. I've already met a number of the past Ambassadors via the race expo and Twitter, and they are an inspirational group of runners. I'm going to need some meet ups ASAP to get to know everyone. Why did I apply and feel so attached to this race? The SF 1st Half Marathon was my very first half back in 2009. Before that, the SF Marathon events motivated me to do my first 5K in 2005 while I was visiting SF from Michigan for a conference. 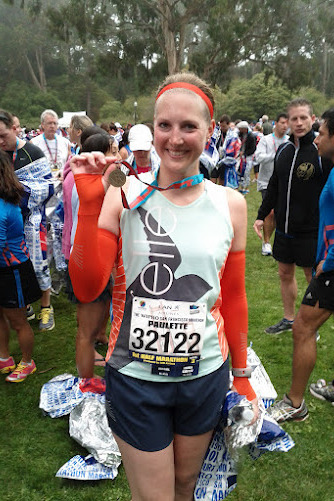 That day, I decided I would run the half someday so I could run the Golden Gate Bridge. Between 2005 and 2009 I had doubts that I'd hit that goal, and I essentially gave up at points. But you know what? I realized I could do it if I worked hard and I reached the goal of running the half. You know you want to run this beauty. That half marathon was the start of my running and racing addiction. It is the reason I'm where I am today as a runner. I'd even say it fueled my desire to move to the Bay Area, another dream that came true in June 2011. I can't imagine another race I'd rather represent than the SF Marathon. I ran the 1st Half Marathon again this past year and dropped my time from 2:31 to 2:13. Not bad for me on a tough course. In 2013, I'll be running the 2nd Half Marathon to complete the 'Half It All' Challenge. And in 2014? The goal is to run the marathon to complete the 52 club. I see a long line of SF Marathon events in my future. If you want to join me in my SF Marathon adventures, registration is open and at the lowest price it'll be. Check it out! I'd love to see you here in SF on June 16, 2013. Congratulations! I love hearing stories about favorite races! Cool! Technically I grew up in Ohio, but I was in Ann Arbor for 7 years before moving to SF. Also, I prefer Michigan! that's so exciting! I bet you will meet some really cool runners through this! Awesome! Congrats on becoming an Ambassador! Sounds awesome! Congratulations!! I know 2 people who became Ambassadors this week - very cool. Someday I'd love to do this race, but I'll need to win the lottery or find a sugar daddy first. Congrats on becoming an ambassador! That is so cool:) Running a half in San Fran is on my bucket list. Eventually, I'll make it out there. AND, HAPPY LATE BIRTHDAY! Congratulations!!! And I love how the race has such a special meaning to you! CONGRATS PAULETTE!!! That's so exciting that you're an Ambassador for a very meaningful race!! Can't wait to hear about all the things you'll do as an ambassador. Do you get cool schwag to wear??? Thanks! Yes fun swag and free race entry too. Plus the community of the runners, which is already awesome.